Two 5.3 earthquakes hit the island of Hawaii, Hawaii. 5.2 earthquake hit northern Colombia. In early August 1975, Typhoon Nina made landfall along the coast of China near Shanghai. The storm weakened as it moved inland and merged with a cold front that straddled Henan Province (in central China), resulting in the development of a series of near-stationary thunderstorms in and around the town of Linzhuang. The greatest short-term rainfall event in modern Chinese records ensued: some 1060 mm (41.73”) of rain fell in just 24 hours. 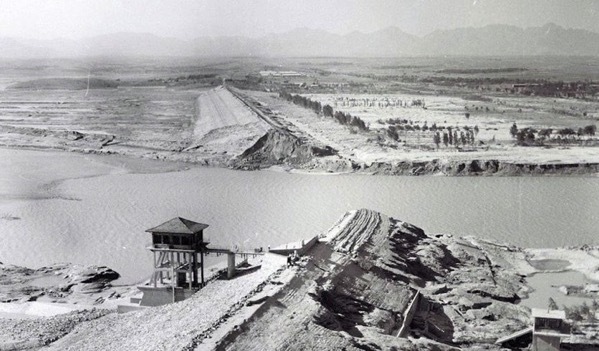 The Banqiao Dam on the Ru River near Linzhuang, failed as a result of the rains and collapsed on August 7-8, sending a wave some 6 miles wide and 10–23 feet deep across the plains below. As a result some 100,000–230,000 people perished. By some accounts, this makes Typhoon Nina the fourth-deadliest tropical storm in modern world history. The wide range in fatality estimates is because many of the deaths occurred as a result of famine and disease following the flood itself. The exact figures for each source of fatalities remains obscure. If the high-end figure of 230,000 is correct, then the event would rank as not only the fourth-deadliest tropical storm on record but perhaps the sixth-deadliest natural disaster of any kind since 1900. Kilauea | Hawaiian Islands (USA) : HVO reported that the eruption at Kilauea’s Lower East Rift Zone (LERZ) and at Overlook Crater within Halema`uma`u Crater continued during 23-29 May. Lava fountaining and spatter was concentrated in the middle portion of the fissure system, feeding lava flows that spread through Leilani Estates and Lanipuna Gardens subdivisions, and also traveled to the ocean. Earthquakes beneath the summit and ash emissions from Overlook Crater continued as the summit area subsided and adjusted to the withdrawal of magma. Ash emissions were small and frequent, punctuated by larger plumes. The Overlook crater vent continued to widen to the W, and by 25 May the vent area was about 36 hectares. At 1244 on 25 May a M 4 earthquake was located in the summit region. That same day a new pit opened on the N part of Halema`uma`u Crater floor. Three explosions (at 0042, 0144, and 0500) on 26 May generated ash plumes that rose 3-3.3 km (10,000-10,800 ft) a.s.l. A small explosion at 0156 on 29 May sent an ash plume vertically to 4.6 km (15,000 ft) a.s.l. and drifted slightly NW. The explosion was felt by residents in Volcano, and ejected incandescent blocks within Halema`uma`u Crater. On 28 May a M 4.1 earthquake occurred at 1739 along the Koa’e fault zone, S of the caldera. On 28 May the vents that fed the ocean entries stopped erupting, leading to only residual lava in the channel to occasionally enter the ocean. During 28-29 May fountains, lava flows, and spattering from multiple fissures persisted. Pele’s hair from vigorous fountaining (60 m high) at Fissure 8 drifted downwind, with some strands falling in Pahoa. According to a news article, the LERZ eruption had destroyed at least 94 structures, including 53 homes, by 29 May. The flows also cut off road access to PGV, which had been evacuated. Klyuchevskoy | Central Kamchatka (Russia) : KVERT reported that a thermal anomaly over Klyuchevskoy was identified in satellite images during 19-20 and 24 May. The Aviation colour Code remained at Orange (the second highest level on a four-colour scale). Merapi | Central Java (Indonesia) : PVMBG reported that a two-minute-long phreatic eruption at Merapi which began at 1349 on 23 May was heard from the Babadan observation post. A plume was not visible due to inclement weather, though minor ashfall was reported in Ngepos post. On 24 May an event at 0256 generated an ash plume that rose 6 km above the crater rim and drifted W. Roaring was heard from all of the Merapi observation posts. A two-minute-long event at 1048 produced an ash plume that rose 1.5 km and drifted W. The Alert Level remained at 2 (on a scale of 1-4), and PVMBG noted that all people within 3 km of the summit should be evacuated. Piton de la Fournaise | Reunion Island (France) : OVPF reported that the eruption at Piton de la Fournaise which began on 27 April from fissures at Rivals Crater continued through 29 May. Tremor levels continued to decrease slightly, though were mostly stable at low levels. Observations on 24 May indicated flowing lava was mostly confined to tubes, though a small area of incandescence was visible at the main crater. Wildfires are raging through several forests, protected areas and bio-corridors in Kailali district, destroying local flora and fauna on their paths. The district’s assistant forest officer Bhim Prasad Dhakal said on Tuesday that wildfires were raging in Mohana bio-corridor and the forests in Basanta, Karnali, Chure and Bhawar areas. “More than 500 hectares of forest cover has been destroyed so far,” Dhakal said. In Kailali, there is no mechanism in place to control forest fires. A fire near Byron, California started to spread quickly on Wednesday, growing to include seven wildfires across 500 acres, authorities said. Firefighters from Contra Costa and Alameda counties were battling flames about 60 miles east of San Francisco, on Wednesday, the Alameda County Fire Department said. 5.2 earthquake hits the Greenland Sea. 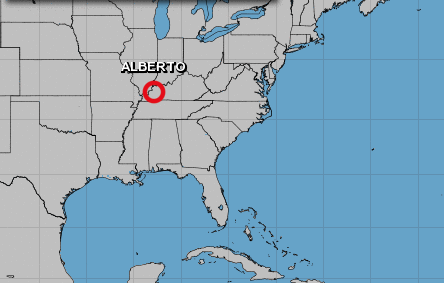 In the North Atlantic Ocean: Sub-Tropical Depression Alberto is located about 55 mi…90 km ssw of Evansville Indiana with maximum sustained winds…35 mph…55 km/h. Present movement…n or 10 degrees at 15 mph…25 km/h. Japanese research vessels harpooned, killed and necropsied 333 Antarctic minke whales during an annual hunt last summer — and 122 of those whales were pregnant. The expedition, reportedly mounted for “scientific research,” also resulted in the slaughter of 114 immature whales, according to a report of the hunt released by the International Whaling Commission. According to the report, researchers set out to acquire data on the age, size and stomach contents of minke whales in the South Ocean between Australia and Antarctica. This involved shooting the whales with grenade-tipped harpoons (a controversial killing method that results in instant death only 50 to 80 percent of the time), hauling the slain whales aboard a research vessel and cutting them apart on-site. 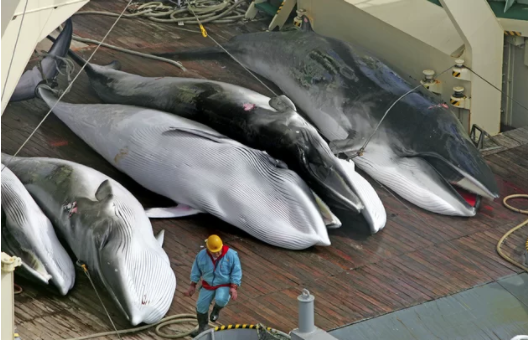 Despite Japan’s claims that continued whale hunts like these are purely scientific, the country also allows whale flesh to be sold in markets and restaurants and ultimately plans to revive its commercial whaling industry, The Sydney Morning Herald reported. This potential profit motive — coupled with recent footage of Japanese vessels slaying whales in an Australian whale sanctuary — has resulted in international condemnation of the country’s brutal hunting practices. Crews are making some progress containing two of three major wildfires that have forced evacuations in three regions of of BC. The wildfire service says the 27-square kilometre Allie Lake blaze northwest of Kamloops is now 35 per cent contained. Guards are up around 25 per cent of the five-square kilometre Xusum Creek wildfire west of Lillooet. But the nearly 170-square kilometre Tommy Lakes fire northwest of Fort St. John is still out of control, seven days after it was sparked by lightning. With the current rainy season and the worsening slum conditions in and around Kampala district, the city didn’t wait long to face another cholera outbreak. Since February this year, most parts of the country have been struggling with cholera as a result of heavy rains. On Friday 4th May 2018, the Ministry of Health in Uganda declared another cholera outbreak in Kampala. Since the start of the year, 400 measles cases, including 14 deaths, were reported as of 20 May compared to 205 cases and one death over the same period in 2017. Three districts have reached the epidemic threshold. In addition, 218 meningitis cases and 34 deaths were recorded as of 20 May. Over the same period in 2017, 181 cases including 16 deaths were reported. Infections in Zour district in the northern Tibesti region reached epidemic levels in early May, while Goundi district in the south remains in alert phase. 5.7 earthquake hits the Sumbawa region, Indonesia. 5.0 earthquake hits San Juan, Argentina. In the North Atlantic Ocean: Sub-Tropical Depression Alberto is located about 30 mi…45 km w of Montgomery Alabama with maximum sustained winds…30 mph…45 km/h. Present movement…nnw or 345 degrees at 13 mph…20 km/h. South Carolina, USA – Rains on the fringes of Subtropical Storm Alberto have caused flooding along the South Carolina coast. Forecasters say Monday’s floods could be just the beginning as Alberto moves onshore in the Florida Panhandle and to the west of the state. Monday’s storms dumped up to 6 inches (15 centimeters) of rain, causing minor flooding around Myrtle Beach and Conway. Rains on the fringes of Subtropical Storm Alberto have caused flooding along the South Carolina coast. Alberto, came ashore Monday along the Florida Panhandle, bringing heavy rain to a wide swath of the Southeast and claiming the lives of two journalists on duty in North Carolina. Mauritania is currently facing a very serious food and nutrition insecurity situation, the worst that the country has seen in the last five years. According to the results of the latest Harmonized Framework (HF) of March 2018, 350,600 people are currently in severe food insecurity (phase 3, 4) and these figures could reach 538,446 people for the projected period of June to August 2018. These projections for the period of June-August correspond to 14 percent of the population, raising fears of a major food crisis. In a follow-up to a report one month ago, the dengue fever situation on Easter Island (Rapa Nui) has grown to 13 locally acquired cases, prompting a health alert for the area. About 1,26,000 cows are expected to be culled, mainly over the next two years, as government and industry work to depopulate all infected farms, the government said in a statement. The disease, which is common in many countries, was first detected in New Zealand at a farm in the South Island last July and some 37 properties have now tested positive for the illness. “Today’s decision to eradicate is driven by the government’s desire to protect the national herd from the disease and protect the base of our economy the farming sector,” Ms. Ardern said in a statement. 5.4 earthquake hits Unimak Island, Alaska. 5.1 earthquake hits the Jilin-Heilongjiang border, China.